Justice for the 96. The truth. On the 15th of April 1989 one of footballs biggest tragedies occurred. 96 Liverpool fans were unlawfully killed. Twenty seven years later on the 26th of April 2016, justice was given to the family, friends those affected. At long last, twenty seven years and 11 days justice for the families has been served. The decision which relieved the packed courtroom finally ended the misery after 27 years of pain and injustice. The decision came just after 11am, the jury said the 96 victims were unlawfully killed. Fourteen questions were asked. Number six being seen as the most significant. Leading Hillsborough campaigner Margaret Aspinall, whose 18-year-old son James died in the disaster , said she was immensely grateful to the people of Liverpool for backing the fight for justice. Margaret Aspinall. The face of pain, struggle, and relief. A picture that needs no words to describe how she must be feeling, after twenty seven years of injustice. Leader of the campaign she never gave up hope and is an inspiration to us all. Video from BBC News showing the families singing “You’ll Never Walk Alone” after verdict outside court. The video shows the strength and unity of the city and what Liverpool stands for. 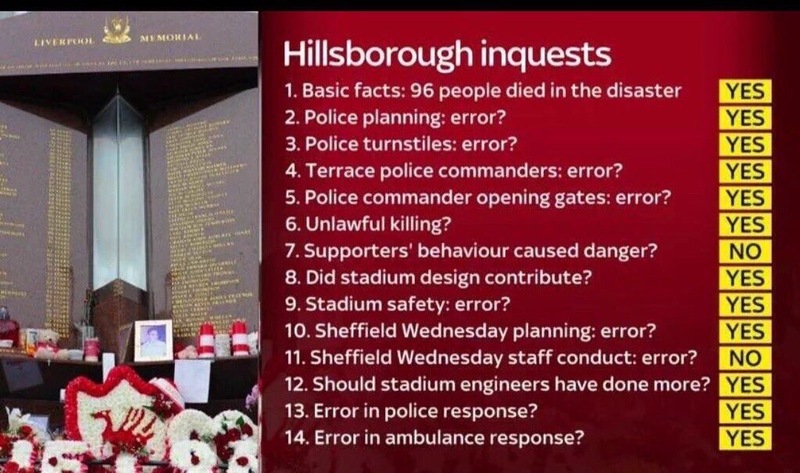 I would highly recommend watching BBC’s Panorama on the Hillsborough Disaster. Finally, Anne Williams. A lady who showed resilience, persistence and courage to win justice for those that died. Sadly is not here with us but I’m sure is watching over, as her hard work and dedication to get the truth, has finally been done.